Archive photo: Brighton and Sussex University Hospitals Bulletin. WHEN New Year’s Day dawned in 1872, no one could possibly have suspected that the year was to begin with an event that almost spelled the end of the Sussex County Hospital. Inside, Christmas decorations were still hanging in the wards. Outside a high wind was blowing from the south east – and it was this bitterly cold wind that was a major factor in the events that were to follow later in the day. It was a little before five o’clock in the evening that Nurse Plummer heard a crackling noise in the small bathroom in the north west corner of No. 6 ward on the top floor of the Adelaide Wing. This was soon followed by the sound of an explosion which, according to the matron, Miss Longstaffe, shook the whole building. At first, a gas escape was suspected, but it appeared later that the cause was overheating of an iron bar connecting timbers on either side of the flues of a hot water tank which was supplied by pipes from a furnace in the basement. When news arrived at the town hall, a strong body of police was despatched with hose reels and a fire escape. Hose reels were also despatched from other police stations and the Volunteer Fire Brigade set out from their Russell Street station with their engine and other apparatus. Later a fire engine was also sent from the cavalry barracks at Preston together with a detachment of the 19th Hussars. A party from Lewes Cliffe brigade also attended. During the first hour, the situation looked so desperate that a steam fire engine was summoned by telegraph from London, although this turned back during its journey when better news was received. By six o’clock the hospital had been cleared of its ‘helpless inmates’ but flames were pouring from the windows on the north side of Ward 6 and gaining ground on the partition wall. According the local newspaper reports, the house surgeon, Mr Keogh, the steward, Mr Percival Boxall, a member of the management committee, a former pupil Mr Kebbell junior, Mr C. Marshall, Mr Willett and a large number of other volunteers climbed on to the roof and formed two rows, one passing full buckets of water, one row returning the empty buckets. An increased supply from the Water Company hydrants at the front of the building then made it possible to pour a stream of water on to the roof and also to flood the ward flooring and the ceilings of the rooms underneath’. During the next half hour ‘the battle was a very close and doubtful one, watched with varying emotions by the large and excited crowd’. There were cries of ‘the roof must go’ and ‘nothing can save the building’ as large fragments of roof, iron girders and wooden beams fell threatening to break through to the rooms below Ward 6. By then, as the fire fighting continued inside in the corridors and outside on the fire escape ladders at the front and back of the building, the crowds thronging Eastern Road and the surrounding streets were so dense it was difficult to approach the building. Fortunately, however, by seven o’clock the fire brigades began to get the upper hand, the flames were totally extinguished and the hospital, with the exception of Ward 6, was spared. Evacuating the patients had not been easy. Many had to be carried down the long flight of steps leading to the main entrance which were slippery with water ‘with a fierce cold wind blowing in their faces’ and the only light coming from the burning building. 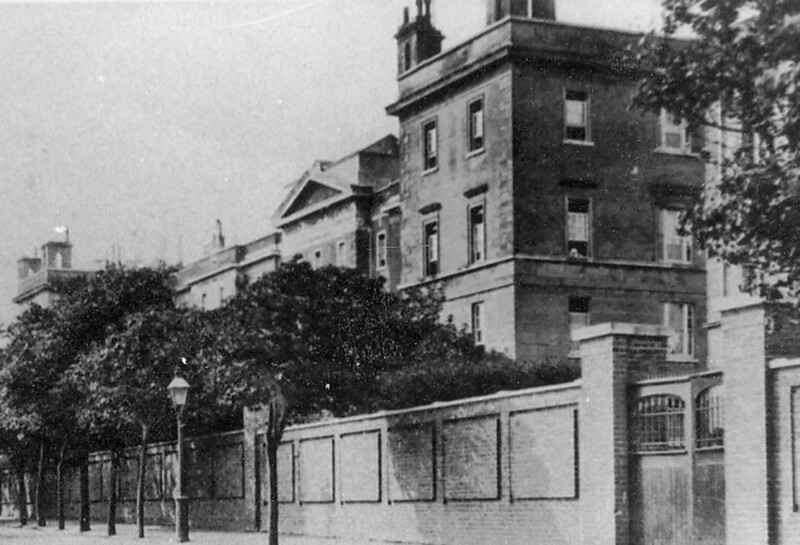 The surgeons ‘and other gentlemen’ made a road through the dense crowds calling ‘make way for the patients’ who were taken away in cabs and other vehicles to places of safety including St Mary’s Hall, Mohammed’s Gymnasium, and St George’sChurch. Later Miss Elliott offered the use of her Convalescent Home in Sudeley Street and at eight o’clock volunteers carried the patients there from the church, while Dr Ormerod himself carried one young patient ‘pick-a-back’ which, according to a newspaper correspondent, was ‘a mode of locomotion the little sufferer seemed to enjoy’. At its meeting held the following Wednesday the board placed on record ‘their thankfulness to God for the merciful preservation of the patients’. Special thanks were recorded to the house surgeon, Mr Nicholls and the pupils Kebbell, Miles and Williams ‘for the courage, energy and self-devotion with which they laboured for the safety of their patients.’ The board also recorded thanks to the matron, the house steward, Mr Keogh, the carpenter, Mr Gibbs, a former porter, Mr Thomson, the foreman of Messrs. Nell and Tuxford, Mr Warwick Standing and the nurses and servants. A vote of thanks was also made to the families in the neighbourhood ‘for their liberal assistance’, to the Chichester Infirmary and to the Sick Children’s Hospital for their offer of beds. Strangely, apart from the minutes of this meeting, hospital records contain few details of the New Year’s Day incident. It’s thanks only to local newspaper reports that it is possible to see just how close to disaster the hospital and its patients had come.